A yearly visit to Liverpool has become something of a tradition for Britain’s premier Boxing promoter Eddie Hearn. A chance to run out a whole host of scouse fighters under his Matchroom stable, to a sold-out crowd who absolutely love their Boxing. The nights co-main, and my pick for fight of the night is a mouth-watering clash between Joe Hughes and Liverpool’s own Robbie Davies Jnr. Despite seeing both the EBU and British Super Lightweight titles on the line, this matchup is somewhat flying under the radar. Joe Hughes wants to continue to upset the odds. A 3-1 underdog in this bout, bookmakers are still to learn not to back against this man. Fighting naysayers, has been a lifetime of work for Hughes who was originally told manual work or even running properly was never going to be possible for him. Now a champion boxer having held the Southern Area and English title he is now a European champion surpassing many expectations, but he will be determined to go once again and defeat Davies Jnr. His last bout saw him visit enemy territory, when he travelled to Florence, Italy to face Andrea Scarpa in Matchroom’s maiden card on Italian shores. Joe Hughes boxed out of his skin, putting constant pressure on the bewildered Scarpa who some fans may remember for his loss against everyone’s favourite Ohara Davies. Hughes would ultimately earn a split decision victory, in a fight that was a clear-cut win, we can only assume one of the judges forgot his glasses. Other high-profile fights have seen Hughes have some mixed form. He impressively earned a draw in his previous British title shot, giving Tyron Nurse all, he could handle over 12 rounds. 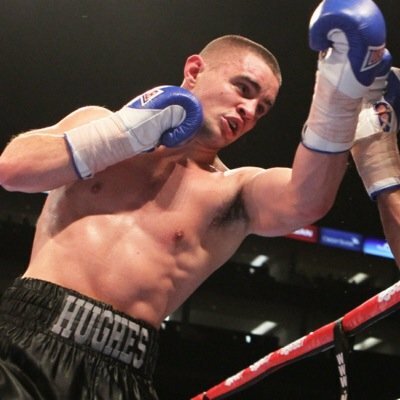 Hughes ultimately walked away disappointed despite being written off in the build-up, he believed he won the fight. Hughes has come up short on 3 occasions. An early career defeat to Joe Elfidh can be written off. However, defeats to Jack Catterall and Anthony Yigit where pretty comprehensive. He appears to be just shy of world level and has struggled to make an impact against his more accomplished opponents. However, he is tough, game and will be there for 12 hard rounds. Robbie Davies has amassed a 17-1 record, but it seemed to take the Liverpool man an eternity to find a home in terms of a TV deal. A famous surname not enough to persuade networks, he had to do it the hard way. By being a hell of a fighter, an exciting one at that. His lone defeat came against Polish fighter Michal Syrowatka in a pulsating clash in which the two men exchanged heavy shots all night. The breathtaking affair eventually took its toll on Davies Jnr, who began to fall apart in the championship rounds, before ultimately being dropped and stopped in the final round. Davies Jnr probably won’t thank me for this but if you haven’t seen this fight go watch it. Davies Jnr immediately scheduled a rematch, citing a multitude of personal and physical issues he fought through during the defeat. For many scouse fans immediate rematches tend to bring memories of David Prices disastrous return against Tony Thompson however Davies Jnr was able to avoid any such unfortune. A brilliant performance saw the Liverpudlian floor his man twice early putting Syrowatka down heavily in both the 3rd and 4th rounds. Davies Jnr pretty much had his way with his opponent, very much in contrast to the first fight. He was able to reverse the first result by scoring a TKO in the 12th round of the contest. Slipping the wild hooks of Syrowatka who as desperate at this point he landed a flush with a perfect lead left hook to floor the Pole and ultimately see the referee wave off the fight. Following on from this fight Robbie began to reap the rewards for his efforts. Firstly, by signing to Matchroom, secondly by getting a shot at both the Commonwealth and British titles in his promotional debut. Davies Jnr once again boxed well against the always game Glenn Foot, who seemed determined to force Davies Jnr into a war. The Liverpool man refused to bite, staying on his back foot, putting heavy shots on his opponent in what ended up being a blood bath. The referee blood soaked himself ultimately lifted Davies Jnr’s hand as he put together back-to-back career best performances. He’ll surely be determined to make it a hattrick come March 30th. Purely based on the fighter’s styles I called this as fight of the night at the top of this article. Joe Hughes will be relentless in his pursuit of victory, giving Robbie Davies Jnr all he can handle. Davies Jnr is the favourite and rightfully so, however to write off Hughes would be foolish. Only one thing can be certain in this fight, fireworks.